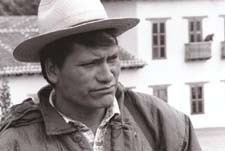 Alonso lives in the Highlands of Chenalho, deep in the heart of Chiapas, Mexico. As a Mayan lay priest, he plays a leading role in his village, a village torn by a conflict that has violently split his community. Since 1994, the Zapatista National Liberation Army, a guerrilla army comprised predominantly of indigenous Mayan Indians, has been involved in a tense military standoff with the Mexican government. The Zapatistas are demanding equal distribution of wealth, land and power for the indigenous population. Although a cease-fire declared by the Mexican government remains in effect (after several bloody confrontations between the rebels and the army), Government supported paramilitary units terrorizing the Mayan peasants have destabilized an already fragile situation. Focusing on the impact the Zapatista and paramilitary violence have had on the day-to-day lives of the Mayan peasants, rather than on political machinations (or glorification of the Zapatistas), ALONSO'S DREAM depicts a harrowing reality. In heart wrenching personal accounts, the people of Chenalho describe the tactics of the paramilitary units. In one instance they collected "donations" for the purchase of AK-47's. Those who didn't cooperate were labeled Zapatista. In another example, a house was set ablaze after the inhabitants are accused of being Zapatista supporters. The culmination of the violence is the Massacre of Acteal, when paramilitary units opened fire inside a church, killing 45 civilians who were seeking refuge. Alonso was drawn into the conflict when he met Maria, a survivor of the Acteal Massacre who lost nine members of her family there. Alonso's quest to bring to justice those responsible, at both the highest and lowest levels, is documented in this film. His calls for non-violent solutions, in spite of repeated death threats, and his relationship with Miguel Chanteau, a French missionary and outspoken critic of the Mexican government who was exiled in 1998, are also explored. Through his story, ALONSO'S DREAM becomes a contemplative and critical assessment of the Zapatista uprising from the perspective of the Mayan people. Chronicles the historic events surrounding the 1997 massacre of 45 pacifist supporters of the Zapatista Army of National Liberation who were massacred while seeking refuge in a church. The story of an elderly man from the Nahuatl-speaking village of San Agustin Oapan, Mexico.